Unlike the European Patent Office (EPO), Team UPC is still trying to lie its way into UPC ratification. If one was to believe them, UPC would have started in 2015 or 2016; it’s almost 2019 and still no UPC. Why? Because they’re liars. They lied to politicians, hoping they would deem it an “inevitability” and sign off profoundly unconstitutional documents. The departure of Sam Gyimah is all over the news today (this morning). The BBC has just mentioned it, as did Politico. So a bad politician who helped Team UPC is officially resigning. Good. 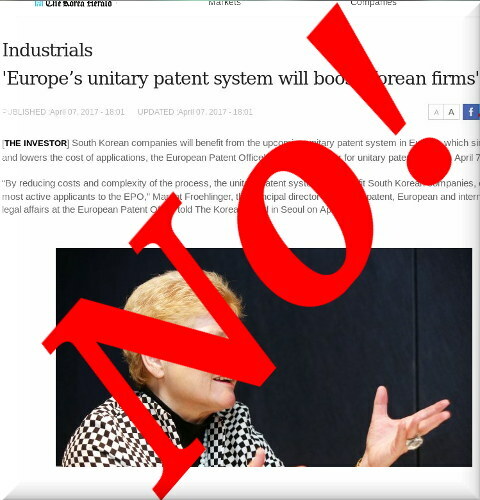 “They’ll be limited by the restrictions imposed by national courts (not CJEU), which cannot be bypassed by some EPO-connected kangaroo court that doesn’t speak the language of defendants.”With Sam Gyimah’s resignation it couldn’t look any worse; after all, it was him who did a publicity stunt for “IP” [sic] Day, announcing a bizarre ratification when there was absolutely no legal basis for it.